Simon Rattle has announced that he will leave as chief conductor of the Berlin Philharmonic Orchestra after his contract expires in 2018. Sir Simon Rattle, who joined the orchestra in 2002, admitted it had not been an “easy decision”. “In 2018 I will be nearly 64 years old,” the British conductor said. The 57-year-old conductor went on: “I am sure that then it will be time for somebody else to take on the magnificent challenge that is the Berliner Philharmoniker. “This was not an easy decision. I love this orchestra and therefore wanted to tell them my decision as early as possible. Martin Hoffmann, the orchestra’s general manager said it was “very sad news” for the orchestra and the city of Berlin. But he said he had “great respect” for Sir Simon Rattle’s decision. “With his outstanding musicality and creativity he has filled new listeners with enthusiasm for the orchestra every day and has shaped the national and international perception of the Berliner Philharmoniker as a vital cultural ambassador for Berlin,” he said. 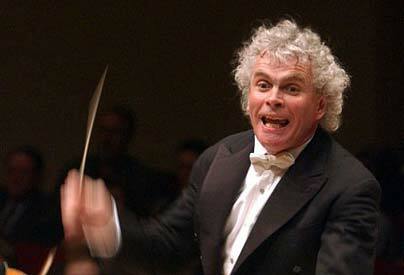 Simon Rattle was born in Liverpool and studied at the Royal Academy of Music in London. He made his Proms debut in 1976 and his opera debut in 1977 at the Glyndebourne Festival. Between 1980 and 1998, he led the City of Birmingham Symphony Orchestra. He was knighted in 1994. Simon Rattle appeared at the London 2012 Olympic opening ceremony when he and the London Symphony Orchestra were upstaged by Mr. Bean while playing Chariots of Fire.